With the new PILOT V Series, WEMPE appeals to customers who are passionate about timeless, beautiful maritime instruments. The concept is catching on: In a stainless steel casing made with craftmanship of high quality you will find the modern technology of Chronometerwerke, as one is accustomed to. Nevertheless, the design of the dial is exeptional. The darkgrey numbers in Arabic numerals are printed on a light-coloured background. The hands are grey, partly with a contrasting red tip. 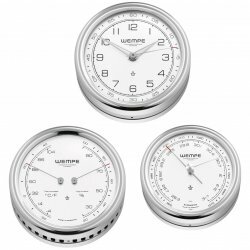 The quartz clock powered by battery of the WEMPE PILOT V Series is complemented by a barometer as well as a thermometre/hygrometre, which indicate the temperature in Celcius and Fahrenheit on the left side and the relative humidity in % on the right side. The simplified appearance of the PILOT V Series appeals to you, but you would prefer a black dial? Then we recommend the PILOT III Series of WEMPE.